LOS ANGELES--(BUSINESS WIRE)--Goodbye Yellow Brick Road, the seminal, 1973 breakthrough album, has been remastered and will be issued on CD, vinyl, limited-edition yellow vinyl, and in a box set featuring recordings of “Live at Hammersmith 1973” on CD, a DVD of Bryan Forbes’ 1973 film Elton John and Bernie Taupin Say Goodbye to Norma Jean and Other Things, along with a 100-page illustrated hardback book packed with rare photos, memorabilia and a new essay containing interviews with Elton John and Bernie Taupin. Also included in the Deluxe Edition and box set versions is a suite of nine, new cover versions of classic songs from Goodbye Yellow Brick Road performed by Ed Sheeran, Emeli Sandé, Fall Out Boy, Hunter Hayes, Imelda May, John Grant, Miguel featuring Wale, The Band Perry, and Zac Brown Band. This was the album that created a true superstar. 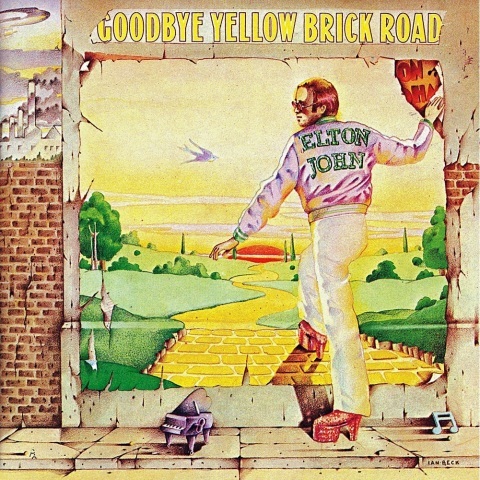 Although he was already known in 1973 due to the growing success of his previous albums—including Don’t Shoot Me I’m Only The Piano Player, Elton John and Honky Chateau—it was the release of this double album, Goodbye Yellow Brick Road, that made Elton John a household name. It went on to sell 31-million copies. Goodbye... perfectly marries the various elements of Elton’s craft: classic songwriting, glam stomp, R&B, gospel, jaw-dropping performances, soul and a large helping of brilliant showmanship. The album spent eight weeks at No.1 and went platinum seven times over in the U.S. It also contains Elton and co-writer Bernie Taupin’s most successful song, “Candle in the Wind;” a No.1 hit three times, in three different versions, in three successive decades, ultimately becoming the biggest-selling single of all time. It also features dynamite standards such as “Saturday Night’s Alright for Fighting” and “Bennie and the Jets,” the latter being the song that led to Elton becoming the first white performer to appear on the influential American R&B TV show Soul Train. The album is also ranked No. 91 in Rolling Stone magazine’s “Top 100 Greatest Albums Of All Time” chart. In a career filled with highlights that other artists can only dream of, Goodbye Yellow Brick Road stands as a towering achievement, a defining moment in the most exciting era in rock history. Often referred to as the pinnacle of Elton and co-writer Bernie Taupin’s creative powers and commercial success, Goodbye Yellow Brick Road was the eighth studio album the pair had released in a three-year period. But the recording of the album wasn't the smoothest of experiences. After initial attempts at recording in Kingston, Jamaica, were derailed by the double whammy of industrial action at the studio and further disruption was caused by a world boxing title fight in the town, Elton and the band returned to the familiar settings of Chateau d’Herouville. The album was completed in a staggering seventeen days (including mixing!) and the result is a body of work of huge ambition—kicking off with the grandiose, epic prog rock sound of “Funeral for a Friend / Love Lies Bleeding,” and effortlessly segueing between pop, hard rock, soul, and stunning heart-wrenching ballads. The album artwork was also a giant leap forward creatively for Elton. Whereas earlier album artwork either didn’t feature Elton at all, or showed him as an earnest early 70’s songwriter, here he can been seen resplendent in sparkling platform boots, a satin bomber jacket and, of course, his soon-to-be trademark flamboyant eyewear. The sight of him stepping from an unglamorous normal street into a magical fantasy world is not only a metaphor for the transition he was going through as an artist but is one of the most defining images of early 1970’s rock music. The lasting legacy of Goodbye Yellow Brick Road can still be seen with a wealth of emerging new talent quick to praise the influence it had on their own careers. Artists ranging from BRIT winner Ed Sheeran (Candle in the Wind), R&B sensation Miguel (Bennie and the Jets), rock band Fall Out Boy (Saturday Night’s Alright for Fighting), add their own interpretations to the classic originals on a sensational bonus disc. Recorded with producer Peter Asher at the helm, Elton and Bernie’s influence on modern day Americana, R&B and soul, and rock singers continues to shine through. On Saturday 22nd March, for One Night Only, CinemaLive in association with Rocket Music Entertainment Group, Yamaha Entertainment Group of America and Universal Music Group will release one of the world's most sensational concerts from the legendary singer, songwriter and performer, Elton John. The concert will be shown in over 200 cinemas across the UK and Ireland, forming a total of 1,200 cinemas worldwide in over 40 countries including the USA, Canada, Germany, France, Italy, Spain, Brazil, Mexico and Australia. At the centerpiece of the performance is the show’s namesake piano, an engineering marvel featuring more than 68 LED video screens created by Yamaha. Nearly four years in the making, the state-of-the-art piano is the perfect accompaniment to Elton’s greatest hits displaying fantastical imagery to complement the entertainer’s fan favorites. Creating a whimsical, one-of-a-kind entertainment experience, the piano weighs in at nearly 3,200 pounds. Visit www.CinemaLive.com for a full list of cinemas where the event will take place on Saturday 22nd March, for One Night Only. Goodbye Yellow Brick Road, the seminal, 1973 breakthrough album, has been remastered and will be issued on CD, vinyl, limited-edition yellow vinyl, and in a box set on March 25, 2014.